A Blog (mostly) about my travelling experience. Before writing about the theme, I'd like to thank you all for reading my blog! 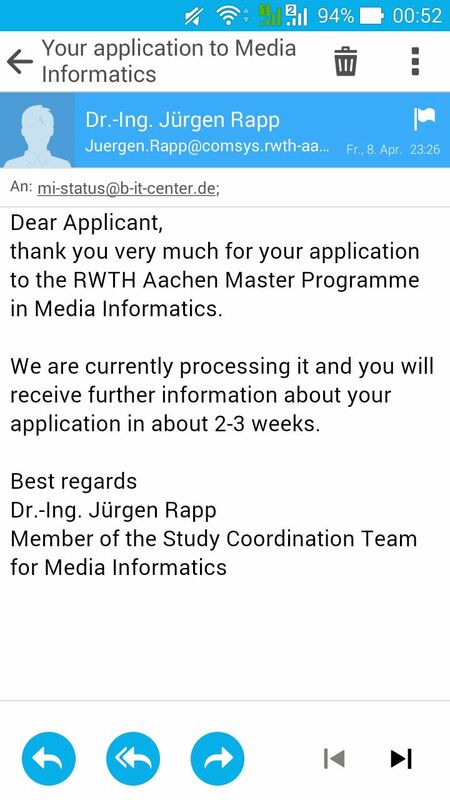 I received a lot of emails every month, especially during RWTH registration time. As a person who wrote a blog for fun and only to share experience, I am very touched and happy to know that some people are feeling motivated by reading my posts :) Thank you!!!! 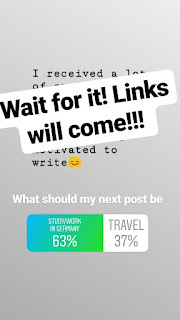 After posting a poll on Instagram, most people voted that I should write about my study/work experience in Germany, so here it is! This time it'll be in English so everyone can understand it. I apologise in advance for any typo/grammar mistakes. I'd say Germany is a pretty affordable country to study since most of the Bundesland don't charge their students for an educational fee, which to be honest, could be pretty expensive in other countries. 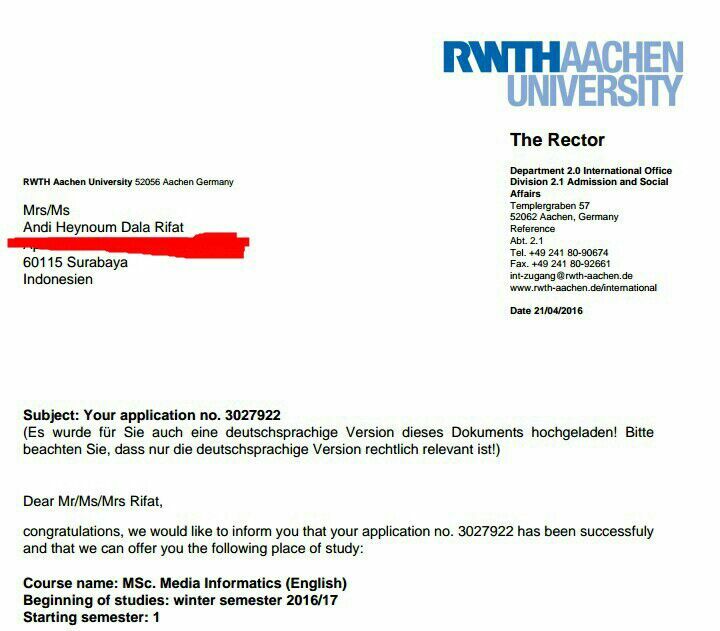 Instead, at least here in RWTH Aachen, we paid around 260€/semester for our transportation, social fee, and so on. The only financial needed before coming to Germany (for those without any scholarship) is the 8640€ blocked account by one of the banks -- which is a lot compared on Indonesians average income, but any other way would be a little difficult. I knew some people who postponed their study here in Aachen to save up some money, but hey, they are here now! 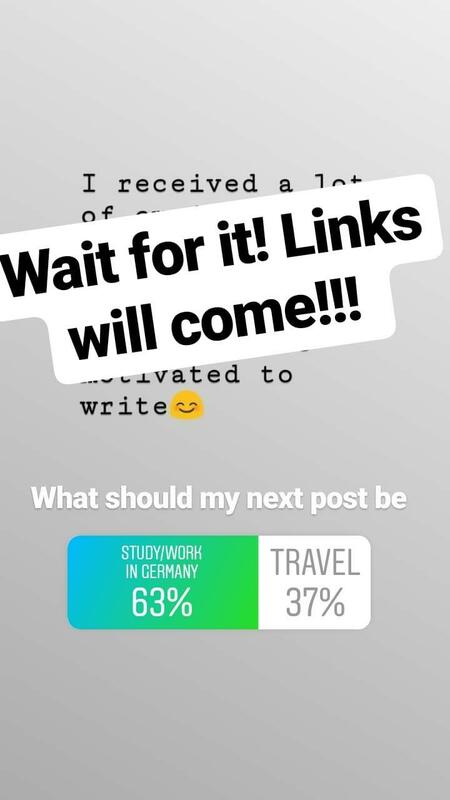 I came to Germany with #ModalNekat (I don't know how to say in English, but it's kinda I flew here with guts and not put very much details of my financial future), but I already set my mind to try to find work as soon as possible. When I still lived in Königswinter during my first semester, I did apply for a few labour work such as working in a hotel or bakery and got some calls for the interview, little did I know back then that I had to have my residence permit in hand before starting to work (I thought my visa would do) so I had to cancel the interview. Better to have some patient rather than working illegally and being deported back! And since I only lived for a semester in Königswinter, I thought it would be wise to wait for a little bit to find a job when I already moved to Aachen. So when I moved into the new (well now not so new anymore :p) city and settled it, and by seeing my friends getting jobs as well, I was on fire to find something! With the help of google and linkedIn, the first job I applied for was to help the Admin team of one company (let's named it company A). Although I have my Bachelor in Informatics, honestly I didn't have the confidence to code (haha), that was why I was trying to find other jobs but programmer :) I also applied to be a student worker at company B, and those two were the only job I applied so far! But then, good news from company A, they invited me to an interview, and they even asked me whether I was interested in another student worker position which was more related to computer science. After setting up a schedule for the interview, I couldn't lie but feel that I was pretty nervous. The only interview I had was shortly before I graduated Bachelor, and I didn't get accepted as well -- what if the same thing happened this time? But then my friends told me that they even applied for 30-40 jobs before they got accepted, and honestly, that gave me a boost of confidence. If this one was a fail, then at least it would be an experience for the next one! I got lucky because the working time for me is flexible. In some company, they have set the weekly working hours, but in the company I am working part-time, I can work up to 19.5 hours per week, and I can set my own schedule. Some people found this as a disadvantage since they want to have a fixed income, but for me who was pretty busy that time after moving to Aachen, this was a good opportunity to measure myself about how I can handle work, especially since this was my first time. And since it was a flexible time, I could take as much holiday as I want, but in the other hand, I wouldn't get paid for not working. In some other companies, e.g. the company my flatmate was working, student workers also got an equal amount of 6 weeks of holidays (e.g, if they work only 2 days/week, then they will get 12 days of holidays!) At the beginning I worked normally 10 hours a week, but starting May last year (after coming back for 6 weeks holiday in Indonesia haha), I decided to work more since I need extra money and I have lots of time (I didn't take any class that time hahaha). What I like the most in working this particular job was that I could use my ability in speaking different languages ;) I have never thought that being able to speak 4 languages, understand (basic level) 6 and can read/write 8 can be used to do something useful and not only for fun! I still remember some of their reaction, e.g. "Wait, you can speak Korean?" "What, you can read and write Arabic???" When exchanging stories with other Indonesian students, I was really amazed that they were working in a factory during the holiday! (Most of them were freshly graduated from high school or bachelor students). I admired their guts and spirit to try to stand on by their own feet at a young age :) (If I remember my self, I was pretty spoiled when I was 18 years old hahaha). I had an Indonesian flatmate who was 5 years younger than me, and she woke up early in the morning to get work at a factory (like, around 3am in the morning), and came back looking pretty tired. So if you were reading this and you did that job, four thumbs up for you!!!!! I believe everyone has different experiences working part-time here in Germany (or in Aachen), but I still couldn't be grateful of how this job has helped me to start earning money by my own and in the end, stopped asking my parents for emergency money. The wage from each company differs, but after talking with some other students, I could say the average was about 10-11€/hour (brutto), and if you can code, it should start at 12€/hour. The highest wage I have heard for HiWi was 17€/hour and that is not in NRW (seriously, I was surprised). But I'd suggest working something that you like (if you can get one) because I do believe you can do a good job if you like the job and not because how much you earn (but on the other hand, don't get underpaid as well:)). And don't forget to balance your study and working time well! I probably have something more to write, but I will do it when I remember them. This time I'd like to tell you about road Jacobs Startup Competition 2017 from the first application until the end of the finale. Since it'll be a long story, I decided to split it into two parts, and this part is more about the preparation and the application (and more of personal stories if you are interested). In November 2016, someone posted about Jacobs Startup Competition on facebook group so I clicked it and read through the website. Jacobs Startup Competition is an annual business plan competition held by Jacobs University Bremen, Germany. I heard about the uni before since a friend of mine studied there back then in 2012. I found it interesting because eventhough it's a "startup" competition, you didn't have to have a "startup" to apply, you could submit your idea. So yeah, I tried to team up with some friends from Media Informatics and submit our idea. The application wasn't complicated to begin with. As far as I remember, you just need to write the name of the team, the idea, and the team. After that I just continued my life. Then I got an email that Cakra made it to the second round. I first thought that the other idea didn't made it to second round, but later on I also received an email that it also passed the first round. So much excitement in one day. For the second round, each team has to submit an executive summary. This one was more complicated and need more time to work on. There were questions that each time had to fill, starting from the background, value proposition, marketing, customer segment until finance. Since it was a busy month and the time to fly back to Indonesia was coming nearer, I almost decided to give up. I mean, not submitting both of the executive summary. I talked with my friends from Media Informatics and they were also busy and said maybe we'll try next year. But for Cakra, it was something different. Eventhough the rest of the team were in Indonesia, they helped me to fill the summary. To be honest I had a lot of stress back then because there were so much things to do in Indonesia (with the wedding preparation). But the Indonesian summary was finished one week before the deadline and you know when the deadline was? ON MY WEDDING DAY. So it was an adrenaline rush for me and I finished translating and submitting it, 6 hours before the wedding ceremony began. Actually, I almost forgot about this fact but a friend of mine who was on my small "bachelorette party" reminded me when I posted a few updates on Instastory. So yeah, some girls came into my room before my wedding day and what did I do? Sitting in front of the laptop and translating (well talking to them as well). So life went on, I got married, I went back to Germany for exam prep, and on February I received an email that Cakra made it to the finale! I was sooooooooooo excited back then. I immediately contacted the team in Indonesia and they were excited as well and will support me. But due to the cost of the flight from Indonesia to Germany, they couldn't accompany me. Another positive thing about JSC is if you got to the final stage, they will assign you mentors. For Cakra we got Nikolas and Max - founders of Tripcombi - to mentor us. They contacted me first and we had one skype session. It was great to hear another feedback. The first round is to submit the idea and it's very simple. If you make it to the final round, they'll assign you mentor(s). I encourage you to participate in this competition because basically you have nothing to lose. So that was the story from the first phase to almost the final part. The next post will be about the final and why I was so impressed. Thank you very much for reading my story! Setelah sekian lama tidak menulis akhirnya saya bisa menyempatkan diri saya untuk menulis lagi. Dari dulu sebenarnya mau tulis pengalaman kuliah di Jerman (selama ini cuma tau sistem sekolahnya saja) dan akhirnya bisa kesampaian menulis setelah 1 semester hampir berakhir. 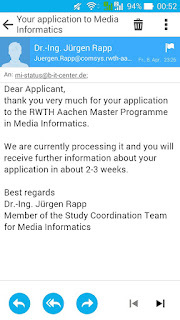 Bagi yang baru pertama kali membaca blog saya, izinkan saya memperkenalkan diri: Dala, 22 tahun, baru menikah, dan sementara lagi menempuh pendidikan S2 di RWTH Aachen University bersama suami :D Jurusan yang saya ambil adalah Media Informatics. Semua yang saya tulis berdasarkan pengalaman saya kuliah di ITS dan di RWTH Aachen, mungkin ada beberapa persamaan dengan univ-univ lainnya di Jerman maupun di Indonesia. Oh iya sebagai tambahan, bahasa pengantar yang saya ambil adalah bahasa Inggris, jadi mungkin saja pengalaman saya berbeda dengan yang mengambil kuliah dengan mata pengantar bahasa Jerman. Salah satu alasan saya untuk menempuh pendidikan di Jerman (maklum beasiswa Ayah Bunda) adalah biaya SPPnya yang 0 rupiah atau 0 euro. Tetapi meskipun tidak membayar uang kuliah, setiap mahasiswa harus membayar uang transpor+uang sosial sebesar kurang lebih 4 juta per semester. Dengan membayar uang semester tersebut (bukan SPP loh ya), setiap mahasiswa akan mendapatkan tiket kereta/bus/tram/metro yang bisa dipakai selama satu semester. Lokasinya tergantung provinsi mana universitasnya, untuk Aachen yang berada di provinsi North-Rhine Westfalia, kami bisa berpergian sesuka hati kami di satu provinsi. Itu berarti bisa ke Düsseldorf, Köln, Essen, Padderborn tanpa membayar apapun! Jadi, 4 juta bisa dibilang cukup murah (biaya 1 kali naik bus jarak pendek di Aachen sekitar 20rb, dan naik kereta Aachen-Köln sekitar 100-150rb). Bagi kalian yang mungkin sering telat bangun, mager ke kampus, atau lebih senang belajar sendiri, mungkin Jerman merupakan negara yang tepat. Sebenarnya tergantung dosennya apakah mewajibkan untuk masuk kelas apa tidak, tetapi kebanyakan dosen tidak mewajibkan mahasiswanya untuk berada di kelas. Tetapi tetap saja berada di kelas dan memperhatikan dosen menjelaskan merupakan nilai plus karena belum tentu semua pertanyaan yang keluar di ujian ada di slide yang telah dishare (pengalaman pribadi ._.v). Di universitas saya sekarang, well setidaknya di jurusan saya, tidak ada rebutan kelas. Tinggal daftar dan datang saja ke kelasnya. Adanya nanti setelah minggu pertama akan dilihat siapa yang dikeluarkan dari kelas jika kuotanya tidak mencukupi. Biasanya diprioritaskan mahasiswa yang wajib mengambil mata kuliah tersebut. Rajin datang di kelas bukan berarti harus mengikuti ujian semester itu juga. Salah satu sistem yang menurut saya pribadi rempong tapi life-saving adalah setiap mahasiswa wajib untuk mendaftar jika ingin ikut ujian. Pendaftaran biasanya dibukan 2 bulan sebelum ujian dan ada waktu batas pendaftaran. Kalau terlewat maka goodbye... ujiannya tahun/semester depan. Memang rempong, tetapi bagi yang merasa dirinya tidak sanggup untuk lulus semester ini, bisa skip ujian dulu dan mengambil ujian tahun depan. Ada banyak mata kuliah yang menjadikan nilai ujian akhir sebagai nilai akhir. Menurut saya hal ini menguntungkan bagi mahasiswa yang tidak suka mengerjakan tugas (karena rata-rata tugas di sini tidak wajib dikerjakan/tidak dinilai/pra-syarat ujian), tetapi tidak menguntungkan bagi mahasiswa yang terbiasa SKS aka sistem kebut semalam karena tidak mungkin bisa lulus ujian hanya dengan belajar sehari. Setiap mahasiswa diberikan kesempatan untuk mengikuti 3 kali ujian tertulis dan 1 kali ujian lisan untuk setiap 1 mata kuliah. Kalau lulus pada ujian pertama, Alhamdulillah. Kalau tidak lulus, mahasiswa diberi kesempatan untuk ikut ujian kedua. Bobotnya sama dengan ujian pertama, jadi misalnya jika dapat A di ujian kedua, nilai akhirnya juga A. Bukan seperti di Indonesia yang memberikan nilai max 75 untuk remedial (ini dulu di SMA saya). Saya memanfaatkan sistem ini untuk mengikuti ujian pertama di satu mata kuliah. Karena saya jarang masuk, saya yakin ujian saya tidak lulus, tetapi saya ingin tahu soalnya kira-kira seperti apa, jadi saya ikut mengikuti ujian pertama. Dan ketika mendapat hasil bahwa saya gagal, saya harus remedial dan sekarang saya memiliki 2 kesempatan untuk ikut ujian tertulis dan 1 kali ujian lisan (jika tidak lulus 3 kali ujian tulis). Apakah akibatnya jika gagal 3 kali ujian tertulis dan 1 kali ujian lisan? Untuk jurusan Informatika secara general, biasanya diwajibkan bagi setiap mahasiswa untuk mengikuti lab/seminar. Kalau jurusan saya, setiap mahasiswa wajib mengikuti 2 lab dan 1 seminar. Kalau di jurusan suami saya (Software Systems Engineering), wajib 1 lab dan 2 seminar. Lab/praktikum berbobot 7-10ECTS dan seminar biasanya 4ECTS. Output dari seminar adalah paper. Terima kasih karena telah membaca blog saya. Jangan sungkan-sungkan untuk bertanya melalui komentar atau email ke dala.rifat27@gmail.com ketika memiliki pertanyaan. Sebenarnya ada postingan tentang pertunangan ala bugis yang sudah ada di draft, tetapi mungkin ini lebih penting. 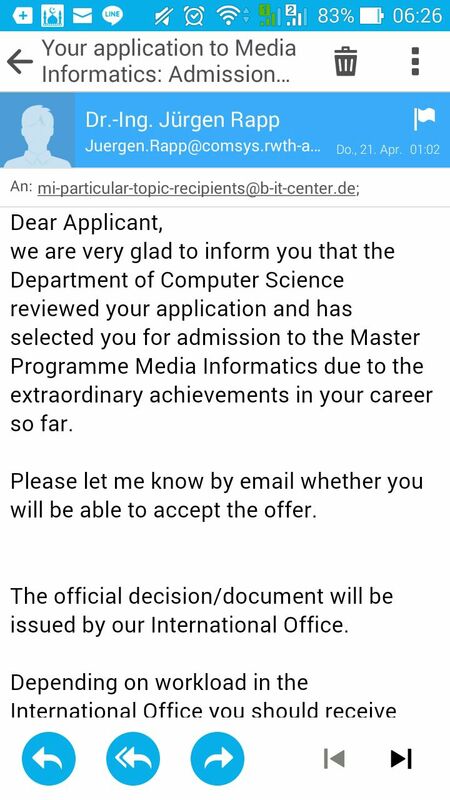 Jadi pada postingan ini saya akan menjelaskan pengalaman mendaftar di salah satu universitas teknik ternama di Jerman, RWTH Aachen University. RWTH Aachen ini di Indonesia terkenal dengan nama "kampusnya pak Habibie", dan di Jerman sendiri merupakan salah satu leading university khususnya di bidang teknologi. Saya mengetahui mengenai kampus ini dari orangtua angkat saya di Jerman, dan juga dari beberapa pameran pendidikan yang saya hadiri (EHEF dkk). Mimpi saya untuk lanjut sekolah di Jerman sudah ada setelah saya pulang dari pertukaran pelajar dengan AFS di tahun 2010-2011 lalu. Tetapi karena untuk melanjutkan di jenjang S1 sedikit rempong dengan studiekollege dan juga Alhamdulillah saya diterima di ITS, saya akhirnya memutuskan untuk menunda niat kuliah di Jerman untuk jenjang S2. Perjalanan untuk mendaftar tidak mudah. Awalnya adalah untuk memutuskan "mau kuliah di universitas mana?". Tetapi untuk mendapatkan jawaban itu, pertanyaan "mau lanjut jurusan apa?" juga harus dijawab, karena belum berarti universitas bagus memiliki jurusan yang kita inginkan. Menurut saya pribadi lebih bagus kuliah sesuai minat daripada hanya mengejar kampus bagus saja. Dalam perjalanan persiapan menuju S2 ini saya lakukan sejak saya berada di semester 5 diantaranya dengan menghadiri pameran-pameran pendidikan dan juga melihat di internet. Pada akhir semester 5 saya menemukan calon teman hidup yang mengerti akan keinginan saya untuk kuliah lagi dan juga ingin melanjutkan S2 bersama dan akhirnya kami membuat google sheet yang berisi semua universitas di Jerman dan program S2 Teknik Informatika yang ditawarkan. Saya juga menanyakan beberapa informasi mengani program kuliah kepada suami kakak angkat saya dikarenakan dia juga lulusan teknik informatika. Sheet tersebut di update beberapa saat dan berhenti pada saat awal semester 7. Setelah melihat-lihat, untuk kuliah S2 yang berbahasa Inggris, pendaftaran yang paling tidak rempong adalah mendaftar di RWTH Aachen University. Saya yang penggemar pak Habibie jadi semangat untuk mengurus pendaftaran. 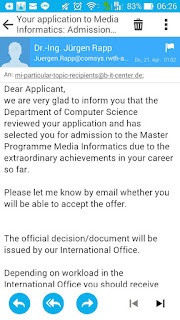 Ditambah lagi untuk program Teknik Informatika, RWTH Aachen menawarkan 2 program master dalam bahasa Inggris: M.Sc in Software Systems Engineering dan M.Sc in Media Informatics yang menurut saya dua-duanya menarik. Semua pendaftaran dilakukan bukan melalui uni-assist, tetapi melalui portalnya sendiri: https://movein.campus.rwth-aachen.de/movein/portal/studyportal.php Jadi langkah-langkah awal yang harus dilakukan adalah. Untuk daftar program S2 yang ditawarkan dapat dilihat di sini. Sudah saya bantu filter untuk program khusus bahasa Inggris (dikarenakan untuk bahasa Jerman agak lebih rempong pendaftarannya). 2. Program yang kamu inginkan ada? Daftar di portalnya! Jika program master yang kamu inginkan ada, silahkan register di portalnya di https://movein.campus.rwth-aachen.de/movein/portal/newapp.php. Klik start untuk memulai. Harap diingat bahwa pendaftaran untuk winter semester DITUTUP pada tanggal 1 Maret tiap tahunnya. Klik next-next dan isi sesuai data yang sebenarnya (asal negara, program yang diinginakn dll). Untuk pertanyaan "do you already have a university degree?" di jawab yes meskipun kamu belum lulus (yang jelas akan lulus). 3. Isi form yang tersedia. Akan disediakan form untuk diisi, seputar data pribadi, nilai ijazah SMA, alamat dll. Harap diisi sedetail dan sejujur-jujurnya. Untuk berkas bisa ditambahkan nantinya (dicicil bisa). Scan semuanya dengan jelas agar bisa dibaca. Saya memulai mengumpulkan berkas sejak akhir semester 7, tetapi dari beberapa bulan sebelumnya sudah meminta izin kepada 2 orang dosen jika berkenan untuk membuatkan saya surat rekomendasi. Bagusnya RWTH Aachen untuk Ijazah dan TOEFL/IELTS bisa menyusul jadi untuk kamu yang masih berada di semester 7 juga memiliki peluang untuk mendaftar (but bakalan telat tiba di Jermannya karena tunggu ijazah kalau lulus pas 8 semester). Surat motivasi jangan dianggap remeh, karena meskipun kelihatan sepele tetapi pas mulai menulisnya idenya lari semua. Ketika semua berkas sudah diupload, form akan otomatis di generated, dan bisa di print. Silahkan print form ini, tandatangani lalu kirim ke Jerman. Berkas paling lambat diterima tanggal 1 Maret untuk mulai kuliah Oktober tahun depannya. Saya sewaktu itu menggunakan Zip courier dari Surabaya dan hanya dikenakan hampir 300ribu rupiah. Dan berkas ini bisa dikirim bareng orang lain jadi mending rame-rame aja kirimnya supaya hemat. Status pendaftaran bisa di cek di https://movein.campus.rwth-aachen.de/movein/portal/login.php?_type=login. Normally, mereka akan mengemail jika terjadi perubahan. Last step, berdoa semoga tidak ada hambatan dan diterima. Aamin. Bisa dibilang tiap hari saya deg-degan menunggu pengumuman. Pada bulan April saya mendapat pesan jikalau aplikasi saya untuk program Media Informatics sedang di proses dan akan diberitahu hasilnya 2-3 minggu lagi. Ah iya, saya mendaftar di dua program tersebut (Media Informatics dan Software Systems Engineering). Pada hari Kamis beberapa minggu berikutnya saya terbangun dan mendapat email bahwa saya diterima di program MSc in Media Informatics. Alhamdulillah, begitu senang rasanya bisa diterima. LoA yang saya terima bersifat conditional dikarenakan saya belum mengumpulkan ijazah dan hasil IELTS/TOEFL. Kendala yang saya terima adalah saya tidak bisa mendaftar visa jikalau dua persyaratan ini belum terpenuhi. Untuk IELTS bisa-bisa saja daftar segera untuk tes. Tetapi ijazah? Harus menunggu dulu, apalagi waktu itu tugas akhir saya masih setengah jalan hehehe (tambah motivasi lagi untuk cepat lulus). 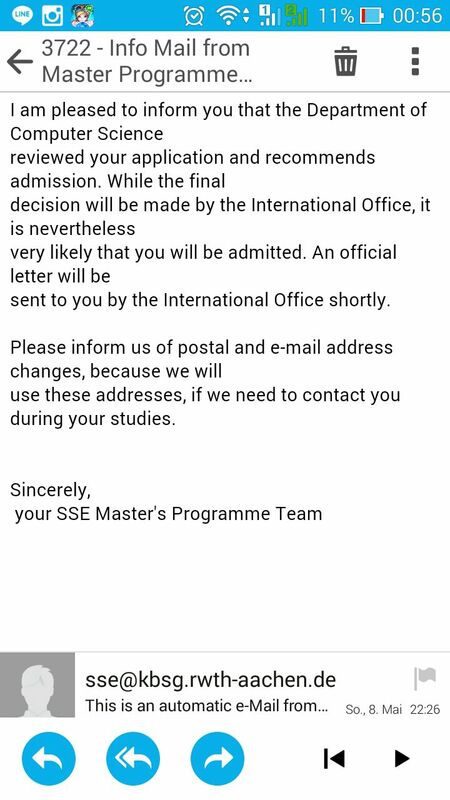 Pada bulan Mei atau awal Juni kalau tidak salah saya mendapatkan email lagi bahwa saya "likely to get accepted" pada program SSE. Dan beberapa hari kemudian LoA untuk SSE pun menyusul melalui portal tadi. Untuk LoA asli juga dikirimkan langsung ke alamat yang kamu tuliskan pada saat pendaftaran. Next step: lulus dan urus visa. Untuk langkah-langkah mengurus visa pelajar Jerman dapat dibaca pada postingan saya sebelumnya di sini. Alhamdulillah visa saya kelar dalam waktu 3,5 minggu (bisa dibilang lumayan beruntung) walaupun saya sangat telat mengurusnya. Saya kemudian berangkat ke Jerman pada tanggal 30 September 2015. Untuk asuransi diharuskan untuk memakai asuransi yang sesuai dengan standar Jerman, dan saya sarankan untuk membuatnya di Jerman dikarenakan sistemnya cashless jadi jika terjadi sesuatu tidak perlu rempong lagi dengan reimbursement. Liebe Grüße aus Königswinter and I wish you a bright future ahead! Kali ini saya akan menuliskan mengenai pengalaman saya mengurus visa pelajar jerman yang kedua kalinya. Pertama kali saya mengurus visa pelajar adalah pada tahun 2010-2011, tetapi waktu itu saya dibantu oleh AFS untuk menyiapkan berkas-berkasnya. Dan kedua kalinya adalah tahun ini, dan tidak ada bantuan dari sana-sini, jadi saya harus menyiapkan semua dokumennya sendiri, tetapi karena itulah saya jadi dapat pengalaman mengurus visa untuk dibagi. Untuk yang bilang urus visa gampang... Hm.. Sebenarnya urus visa memang gampang. Kalau berkasnya lengkap. Nah, melengkapi berkas-berkasnya ini yang rempong dan biasanya ada keraguan apakah berkasnya sudah benar atau belum. 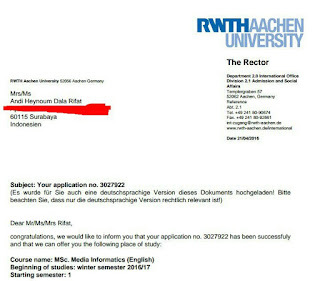 Saya menerima surat penerimaan saya dari RWTH Aachen pada bulan April 2016, beberapa teman dari negara lain langsung mengurus visa saat itu juga. Tetapi saya tidak bisa. Kurang IELTS dan Ijazah. Saya yang notabene waktu itu masih mengerjakan skripsi ya tidak mungkin ada ijazah duluan, hehehe. Rekening Deutsche Bank juga belum punya, dan itu ngurusnya memakan waktu lagi. Sekian dulu curhatnya, sekarang lanjut ke langkah-langkah mengurus. Untuk kuliah di Jerman, jenis visa yang dibutuhkan adalah Visa Nasional, yaitu izin tinggal lebih dari 90 hari. Perlu di ingat untuk mengajukan jenis visa ini jika ingin kuliah. Karena jika mengajukan visa schengen, visanya tidak akan bisa diperpanjang di negara tujuan, sehingga harus balik lagi ke Indonesia untuk mengurus ulang. Untuk keterangan lebih lanjut bisa dibaca di sini. Berikut merupakan list-list kebutuhan yang dibutuhkan untuk mengajukan visa pelajar atau national visa pada kedutaan Jerman. Untuk list umumnya bisa di lihat di sini dan untuk melanjutkan studi dapat dilihat di sini. Saya akan menjelaskan lebih rinci mengenai syarat-syarat kelengkapannya. Formulir. Di print 2 rangkap lalu di isi dan ditanda-tangani. Download FORMULIR VISA NASIONAL. Di isi selengkapnya. Jika punya istri/suami dan anak juga ditulis. Begitu juga informasi orangtua. Untuk tempat tinggal, jika belum mempunyai tempat tinggal yang pasti di Jerman, maka tulislah alamat kampus anda. Lembar pernyataan sesuai pasal 54 dan 55 izin tinggal. Isilah pertanyaan-pertanyaan yang ada dengan sejujurnya, tetapi saya rasa sebagian besar tidak akan memiliki masalah dengan lembar pernyataan ini. Pasfoto 3 lembar. Ukuran visa schengen ya 3.5x4.5. Jangan foto sendiri mentang-mentang mau murah, soalnya ada beberapa peraturan untuk foto visa. Saran saya silahkan ke studio foto terbesar, dan bilang mau foto visa schengen. Muka 80%. 1 lembar pas foto nanti ditempel pada formulir, sementara 2 lainnya diselipkan saja. Passpor. Asli dan fotokopi. Fotokopinya pakai lembar A4 ya. Saya pernah bermasalah waktu fotokopi passpor dan dipotong sesuai ukurannya sewaktu mengesahkan dokumen pembukaan rekening. Yang difotokopi lembar yang memiliki informasi (halaman depan, halaman alamat dan ttd, visa-visa dan stempel-stempel). Polis asuransi kesehatan. Nah, kalau yang ini saya tidak tau apakah wajib atau tidak. Soalnya ada yang tidak ditanyakan polis asuransinya. Tetapi, hindari segala kemungkinan pengajuan visa tidak diproses, jadi sebaiknya tetap membuat polis asuransi. Toh tidak ada ruginya juga buat kita. Untuk durasi polis juga bervariasi, ada yang 1 bulan, ada yang 3 bulan. Saya tidak tahu apakah ada pengaruhnya atau tidak pada pengajuan visa. Kalau saya pribadi langsung membuat polis 1 tahun yang berlaku 90 hari per perjalanan ke sana. Harga polis saya US$109. Daftar riwayat hidup berbentuk tabel. Awalnya saya bingung CV dalam bentuk tabel itu kayak bagaimana. Akhirnya setelah browsing, saya akhirnya tahu kalau CV dalam bentuk tabel itu tabelnya tidak terlihat (saya kira awalnya tabelnya terlihat garis-garisnya). Di buat tabel agar lebih rapi. Saya tidak membuat from scratch melainkan melalui europass cv. Di sini ditulis semua pendidikan mulai dari kecil hingga sekarang, dan tidak ada gap waktu antar tahunnya (jika ada, sebaiknya dijelaskan). Pembiayaan selama tinggal di jerman. Jika lewat beasiswa seperti LPDP dan yang lain, maka lampirkan bukit penerimaan beasiswa dan besarnya. Jika non beasiswa, lampirkan surat konfirmasi dari Deutsche Bank mengenai jumlah uang di rekening anda dan berapa banyak yang di blocked. Sekedar curhat, bisa dibilang kami-kami yang mendaftar di bulan-bulan begini kena apes. Kenapa? Soalnya terjadi perubahan pada jumlah blocked account yang awalnya €8040 (bisa ditarik €670/bulan), menjadi €8640(bisa ditarik max €720/bulan). Dikarenakan membuat blocked account pada bulan Juni dan peraturannya belum diperbaharui, akun kami cuma di blocked €8040. Beberapa petugas di kedutaan akan meminta untuk memperbaharui terlebih dahulu, dan ada beberapa yang tidak. Jadi tergantung keberuntungan apakah pembiayaan ini bakalan dipermasalahkan atau tidak. Konfirmasi Penerimaan atau Letter of Acceptance (LoA). Kalau dikirimkan melalui email atau melalui pos belum tiba, tidak apa-apa yang di email yang di print. Harap diingat jika LoA kamu bersifat conditional, kamu harus menyertakan persyaratan yang telah terpenuhi. Sebagai contohnya saya memiliki conditional LoA yang menyaratkan ijazah dan IELTS, maka saya melampirkan hasil IELTS saya dan SKL (Ijazah belum terbit) yang sudah diterjemahkan ke bahasa Inggris. Nah, untuk SKL ini saya tidak tahu apakah bermasalah atau tidak, semoga saja kedutaan tidak mengemail saya dan menyatakan bahwa harus ijazah yang dilampirkan (karena ijazah terbitnya pas wisuda dan itu akan sangat menunda penyelesaian visa). Nah, setiap dokumen diatas disiapkan 2 lembar kopian (kecuali pas foto 3). Kalau ada yang asli juga nanti disertakan saja sebagai bukti (tetapi nanti dikembalikan kok). Membuat janji. Tanpa membuat janji terlebih dahulu, kamu tidak akan bisa mengurus visa. Termine atau janji dapat dibuat pada website kedutaan. Disarankan buatnya 2-3 bulan sebelum berangkat (jangan seperti saya) dikarenakan proses visa yang bisa memakan waktu sampai 6-8 minggu. Dan juga almost impossible untuk mencari janji H-7 (kecuali ada yang cancel). Datang ke kedutaan 30 menit sebelum waktu. Saya sarankan mengambil janji pada pagi hari. Dikarenakan sangat jarang termine yang selesai tepat waktu. Kalau di jadwal kamu 07.30-08.00, kemungkinan urusanmu bakalan beres jam 9. Jadi, semakin pagi, semakin sedikit antrian. Saya dulu pernah buat termine jam 10.00, dan keluar dari kedutaan pukul 15.0. Periksa surat Kontrolausdruck dan tanda tangani. Jika persyaratan lengkap, akan dikasih 2 lembar untuk ditandatangani. Periksa baik-baik semuanya, jangan sampai ada yang salah. Kembalikan lembar yang sudah ditandangani. Setelah dikembalikan kamu akan disuruh tunggu sebentar dan setelah itu dikasih kuitansi dan boleh pulang deh. Tetapi, bukan berarti kamu membayar dan pergi semua pasti akan baik-baik saja. Terkadang, kedutaan akan mengirimkan kamu email untuk meminta beberapa kekurangan berkas, dan pengajuan visa tidak akan diproses sampai berkas tersebut dikirimkan. Kalau mau jujur, untuk bisa tembus menelfon kedutaan itu seperti keajaiban, jadi jika ada keraguan atau rasa gundah di hati dan visa tak kunjung datang *ceileh*, silahkan email terlebih dahulu, jika masih kurang jelas, saya sarankan langsung datang ke loket 5 di kedutaan dan bertanya. Jika ada pertanyaan silahkan bertanya lewat komentar atau mengirimkan saya pertanyaan melalui email dala.rifat27@gmail.com. So I'd like to share some experience regarding my first ever IELTS and the preparation. 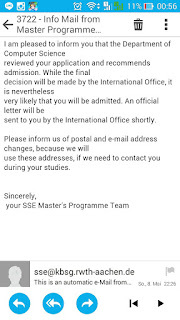 I need to take the IELTS test as a requirement for enrolling in the master degree. And to be honest, I didn't have much time because of the undergraduate theses and so on, so no time to take course either. It's a bold move, but I had to take it otherwise I wouldn't be able to enroll. I signed up for IELTS at the end of June at IALF Surabaya. Unfortunately there was no place left for the nearest test took place in Surabaya, so I signed up to take the exam in Malang instead. I had also try to contact IALF Jakarta, but all the places were also taken, and worse, for the whole month. So from the end of June till the day of test, I had approx. 16 days to learn, and believe me, it wasn't actually enough. I got lucky some friends of mine had the test and shared their experience. So the tips below are not originally from me, but from my friends as well, and from some video that I watched. Know the institution that offer the test. Note that some place have their listening exam on the different day (which is not recommended for people who'll take the exam not on their hometown). Sign up as soon as possible! Especially if you need the result to be one of requirement for visa. And well, if your score is not enough, you can retake it as soon as you can. Set a target. The university I got accepted only ask for 6, so I aimed to get a minimum 6.5. Know your weakness and strength. I am really bad at writing (grammatically and vocab), so I set my target lower for writing, and higher for others. PRACTICE as many as you can. There are tons of books you can find at the bookstore or download from internet. I remember there was one day when we answered (well someone asked me to practice together) more than 200 questions on listening. A senior of mine got a perfect score on listening because he answered all of the questions from some books. Practicing makes you to get used to the type of question that will be asked. GET A PRACTICE PARTNER. It's better to know someone who'll take the test soon. You'll get more motivation to beat each other score at practice. You'll have to answer 40 questions which are divided into 4 sections (10 questions each), two conversation and two monologues. The answer could vary from multiple choice or fill the blank. Once again, PRACTICE as many questions as you can to get used to. The first and second section will be easier than the rest. Note that you'll only hear everything once. Do not answer directly on the answer sheet. You'll have extra 10 minutes at the end of listening section to do that. Answering directly will lower your concentration. They'll give you time to read the question first. DO READ THEM FIRST! and note some important parts so you'll know the answer directly when you hear them. Be careful of paraphrasing. On the third and fourth section, it gets trickier. That's why (once again) you need to READ THE QUESTION FIRST. Be careful of spelling, take note when it's plural or singular. I only did reading practice less than five times. There are a few type of questions that will be asked, whether fill in the blanks, multiple choice, true false not given, or yes no not given. You'll also have to answer 40 questions which are divided to 3 sections. To be honest, 60 minutes is not enough for me, but somehow I managed to answer all. Do it BACKWARDS. I mean, from the latest section. A friend of mine gave me this tips and I found it really helpful. The last text will be the most difficult and complex text, so it'll be much better when you read and answer the questions when you still have full concentration. BE CAREFUL of "YES, NO, NOT GIVEN" and "TRUE, FALSE, NOT GIVEN". Some people had them switched. If you answer "true" on a "yes, no, not given" part, you'll get 0 points. All of fill in the blanks word will be found at the text, so read it carefully! Set the time to answer each section, e.g. 15 minutes for first section, 20 min for the second, and 25 for the last. Oh well, hello there, darkness my friend. I didn't have the chance (or let's say I was lazy) to practice writing. But I couldn't deny the fact that this section kept haunting me and make me unease everytime I thought about the test (before the D-day). I felt like everything I should write was there already on my head (there's a saying once a debater always a debater). So please do not forget to practice at least once so you can measure yourself. I think it was normal for people who didn't have any preparation course to have some fear about this section. Actually I had the fear because I heard my friends who had taken the prep course explained a lot about grammar, rules etc etc, so I kinda feel like ("whaaaat are they talking about? Oh man, that all sounds so difficult..). In the writing section you'll get two tasks, the first one is to give a report about given chart/map/tables, and the second one is to analyze a given question. You have to write min. 150 words. You should have around 4 paragraphs: introduction, overview, section a, section b. You'll get a description of the table/chart/maps. Write this description in your own words on as you first paragraph (introduction). Paragraph 3 and 4 consist of the description of the drawing, and group them nicely. Do not only write one paragraph to explain the whole drawing! Give details to everything that you write. If you write "a country A has the highest amount of population..", don't forget to add the numbers! Surf around the internet and find some example of the answer! I regret didn't do this. I only read the answer using charts, so when I got table to report, well, I was really down at that time. Note that the second tasks values double, so you should spent about 40 minutes on this task. You'll have to write minumum of 250 words. To be honest, I spent more time on the first task rather than the second task. And my writing score is the lowest. My favourite part! I love to speak! You won't need pen to speak, just think on your head, and say it out loud! Hahaha. After the writing section, you'll be asked to leave the room. Usually before the begin of the test, you can see the schedule of your speaking test. I got lucky I was the second person, so my test was around 1 p.m (It was in Malang, and I had to drive back to Surabaya, so going home as soon as possible is neccessary). Be confindent. How can you get high score for speaking, if you don't have confidence at first place? Take it easy. Try not to tremble. The examiner usually really nice person. Mine was smiling since the beginning, so I knew it wouldn't be so scary. It'll begin with a simple question: "can I look at your ID?" "Tell me about yourself"... I think all can answer these questions easily. Then, he'll open the book that contains a lot of question and ask you more. For example, I was asked if I like to sing. Then he asked why, and narrowing the question. And, the cue card. The examiner will give you a pen, and a topic and a set of questions you should talk about for 1-2 minutes. You'll be given a minute to think (or to write). After a minute, he'll ask you to start talking, and stop you if the time is up. Then, you'll be questioned about your little presentation. It starts with an easy one, then more detailed one to see your reaction as well as your answers. I was a bit nervous on this part, especially when he asked me more difficult question. In total I got 7.5 which was quite surprising hahaha. So before taking the test, you should sometimes measure yourself whether you might get your target score or not. But if you have already signed up for a test, and didn't have any prep course, I suggest you to practice every day. IELTS test is expensive, and the least that you want is to retake it after you just done one. Soo.. that's some tips from me! I hope it helps! Good luck for your test!! If you have any question, please don't hesitate to ask me! Jadi ceritanya kemarin, 27.6.2016, saya bersama mas Ali menuju ke Kedutaan Jerman yang letaknya di dekat bundaran HI untuk membuka blocked account di Deutsche Bank. Sekedar info, blocked account ini merupakan syarat wajib bagi calon mahasiswa yang akan melanjutkan kuliah di Jerman (tanpa beasiswa ataupun Verpflichtungserklärung). Dalam blocked account ini akan tersimpan uang mengendap (untuk persyaratan tahun ini €8040 tapi ada issue kalau naik jadi €8640) selama setahun dan bisa diambil setiap bulannya (setidaknya kita ga kelaparan di negara orang). Jadi untuk kalian yang membaca postingan ini dan berniat untuk melanjutkan studi di Jerman, saya sarankan untuk segera membuat karena mendapatkan LoA bukan menjadi syarat utama untuk membuka rekening blocked account. 1. Download formnya di sini dan isi (bisa secara elektronik atau tulis tangan), tetapi perlu diingat jangan tanda tangan dulu, tanda tangannya di depan petugasnya di kedutaan. 3. Datang ke kedutaan. Untuk buat rekening ga usah pakai janji, langsung aja bilang ke pak satpamnya mau buka rekening. Oh iya, sebaiknya barang yang dibawa ga usah banyak soalnya isi tasnya di cek dan hp dititipkan. Masuk ke dalam dan ambil nomor antrian. Kami datang hari senin dan kiranya bakalan banyak antri, ternyata ga. Ga sampai 15 menit malah sudah nomor antrian kami (bisa langsung berdua), setelah disuruh tunggu sebentar dan akan dipanggil lagi. Setelah dipanggil akan diberikan kuitansi. 4. Kirim berkasnya ke Deutsche Bank di Jerman, bisa lewat DHL atau yang lain. Kalau mau cepat bisa lewat kedutaan (harganya lebih murah). Saya dan mas Ali memilih jalur lewat kedutaan. Selesai. Ketika berhasil dibuka akan diemail oleh pihak Deutsche Bank. Sampai sekarang masih kurang tau estimasi waktunya berapa, nanti saya update lagi. ISFiT 2015 : Pre-ISFiT. Perjuangan dari mendaftar sampai sebelum berangkat. Naiknya harga BBM : Setuju atau Tidak? Apa yang harus pemerintah lakukan? Apa yang harus mahasiswa lakukan?